Yesterday was a standard Monday by anyone's imagination. I woke up early and WAY too tired to be normal. I figure that is a little bit exhaustion from coming off the weekend and a little bit 34 weeks pregnant. Does that sound accurate? The dogs and I hit the treadmill, but only for a half hour today instead of the hour that I have been pushing myself to do. My legs and shins were feeling really tight and honestly, hurting a bit, so after just over 2 miles, I shut the thing off and decided I was going to do some body weight exercises until the end of Chopped, which is what I was watching to pass the time. I did lots of squats, lunges, leg lifts from various directions, wall push ups, etc. Nothing to straining on my arm, but I did not give my body a break. I tried to incorporate a few cardio type exercises as well just to keep my heart rate up. After the workout, the pups and I went upstairs so I could get dressed for the day. After showering and getting dressed, I hopped back into bed with my head at the opposite end (planning to cuddle with my dogs) and ended up out for about 15 minutes. See? I told you I was wiped. Not sure that the 15 minutes did me too much good, as I spent the rest of the day feeling tired still, but it is better than nothing, right? I am getting to the point where sitting in my desk chair is definitely getting uncomfortable. I have to sit back further from my desk (and reach my arms further forward to type!) in order to accommodate the bump, not to mention the fact that my pelvic region and lower back are hurting much more frequently than they used to. I am taking that as a excuse to get up and walk around the building as frequently as I want. At this point I need these breaks as much physically as I do mentally. My focus just also is not what it was a few short months ago. But I am still working hard daily, trying to hammer through my "to-do" list and check things off because it makes me feel good to do it. Last night I made my homemade (even the crust!) 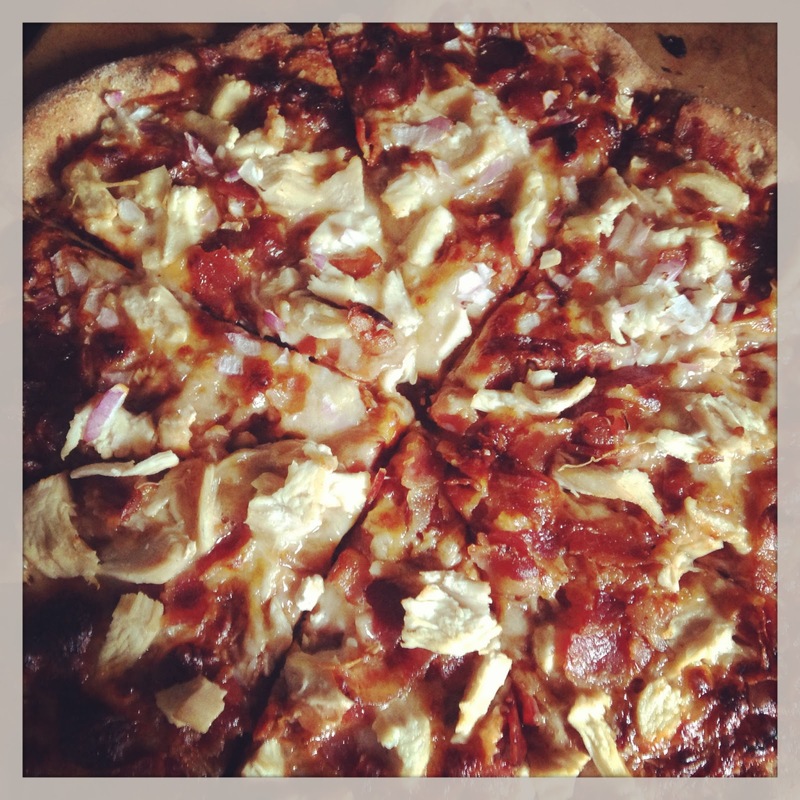 BBQ chicken pizza for dinner. It is one of J's favorites, always, so I figured it would be a good choice to have cooking while he was working in the bathroom right off the kitchen. Then there would be lots of good smells floating his direction while he worked making him look forward to dinner. It was a hit as usual. J ate half of it, and I had two slices and brought the final two with me to work today, I am planning on having them for lunch! (I love it when we have enough food for lunch the next day. That is the great thing about our dream dinners right now. 3 servings = Emily's lunch the following day!) I always am feeling better when J and I get our meals planned and we shop to them. My grocery bill is more normal AND we have a plan for the week that we tend to stick to. Physical therapy yesterday (my 7th session) went pretty well. It is hard to believe how far removed from surgery I am already - more than a month! It is great to see all of the things that I am able to do now, however, it is frustrating to see the things that I still cannot do. I am nervous about having all of my mobility return, and maybe that it won't. I know I need to be open to that possibility, even though right now they do not think that is the case.